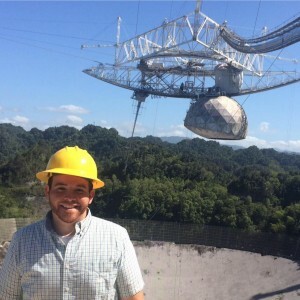 Our final Icy Moons curator and Iapetus specialist on Saturn Week is Edgard Rivera-Valentín (@Planetreky), a Staff Planetary Scientist with the Universities Space Research Association at the Arecibo Observatory in Puerto Rico. Ed holds bachelor’s degrees in Physics and Mathematics from Alfred University and a Ph.D. in Space and Planetary Science from the University of Arkansas. Ed’s research focuses on life by studying three important subjects: (1) The origins and evolution of the Solar System, which provides the initial conditions for life, (2) The potential for present-day habitable abodes beyond Earth by searching for the appropriate environmental conditions, and (3) Safeguarding life on Earth by studying and tracking potentially hazardous asteroids using the Arecibo Observatory Planetary Radar. Here is Ed’s story. I was born in the city of Arecibo, PR near the Arecibo Observatory. Early in my childhood my family took me to visit the Observatory, where I was inspired by their amazing scientific work. Throughout my childhood I knew I had to study astronomy to meet the challenge set before me by the Observatory. Later in college, I was introduced to Planetary Science during an internship at the Lunar and Planetary Institute. After this experience, I knew I had to study our Solar System. I love space. I am still very much fascinated by the myriad of processes that occur on our neighboring worlds. I also love math and coding and testing my theories with real, in-situ data. In essence my work can be summarized as life: I study the origins and evolution of our Solar System, which tells us about the initial conditions for life; I study the potential for present-day habitable abodes in our Solar System by searching for the environmental requirements for life; and I help safeguard life on Earth by studying and tracking potentially hazardous asteroids using the Arecibo Observatory Planetary Radar. One of the fundamental questions for the exploration of our surroundings has been “Are we alone?” This question has led societies to venture over mountains, traverse seas, and launch into space. My work is motivated by this question as I seek the origins of our Solar System and present-day habitable environments in our Solar System. Closer to home, observations of near-Earth asteroids using the Arecibo Observatory allow us to precisely measure the distance to such objects down to meters and their velocity down to centimeters per second. This information, along with insights into the surface characteristics, size, shape, and even geology, allow us to understand the potential danger such objects pose and to adequately prepare an impact mitigation plan to protect the Earth from devastation. I am the project manager for the Arecibo Observatory Space Academy (AOSA) and Arecibo Observatory Semester Internships (AOSI). AOSA is a pre-college program for high school students in Puerto Rico that provides hands-on research experience throughout the semester. AOSI provides undergraduate students in Puerto Rico with advanced research experience at the Arecibo Observatory during a semester for college credit. Ideal Day Off: Relaxing at the beach and listening to the waves during the day, exploring a new city in the afternoon, going out to a nice restaurant in the evening, and then dancing the night away. Please welcome Ed to Real Scientists!